It’s always presumed that celebrities who enter the jungle are truly given the full jungle experience; meaning no TV’s, mobile phones or any other items that could be deemed a luxury as they test their survival skills. However, last night, viewers were shocked to learn that one celebrity had been given a luxury item without earning it, as the camera panned across them. A few days ago, Nick Knowles was given his luxury item – a pillow – but chose to give it away to fellow campmate Anne Hegerty, who is best known for playing the role of The Governess on ITV’s The Chase. Anne had admitted that living in the jungle was taking a real toll on her body and she was really struggling to cope. Viewers hearts melted at Nick’s sacrifice and an insider revealed that giving away his only source of comfort could put him in real agony. Nick is suffering from a severe shoulder injury, but upon receiving the pillow, he told his fellow campmates that he was always going to give it up if there was another person who needed it more. A source told The Sun: “Nick handing his pillow over to Anne was actually even more generous than people at home know”. “He needs a good pillow because he has an old shoulder injury from a long time ago that still causes him pain. He gets a really stiff neck and will have been in constant pain sleeping in the jungle. But that’s so like Nick, he always puts other people first and would have wanted Anne to be happy. “Dear diary I think I love Nick Knowles”. “Nick Knowles is such a lovely, wholesome man”. Some weren’t as impressed by the seemingly kind gesture though. Presenter, Andi Peters claimed it may just have been a clever tactic to try and win over viewers. “He requested the pillow – he didn’t know who else was going into the jungle with him so he requested it for himself.” Andi told Scarlett Moffatt and Joe Swash on Extra Camp. Who’s been given their luxury item early? In yesterday’s show, some fans were convinced they saw Hollyoaks star, Malique Thompson-Dwyer holding a cigarette. Some would argue that ciggies are not an absolute necessity for survival in the jungle. So, was the ciggy Malique’s luxury item or are smokers automatically handed them? This query was raised again in last night’s show when Noel Edmonds claimed he hadn’t seen Rita Simons without a ‘ciggy in her mouth’. According to insider sources, cigarettes are not a luxury item – campmates who smoke are given cigarettes each day by bosses of the show. Viewers saw Deal or No Deal presenter, Noel Edmonds make his way into the jungle last night, after being crowned as the emperor. 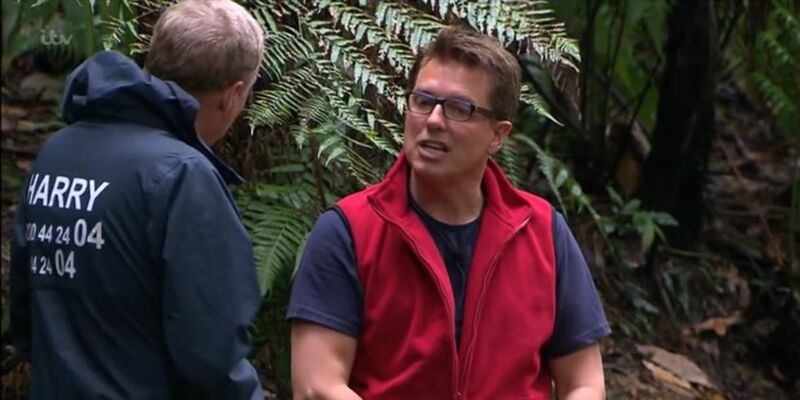 It seems as though the newbie campmate isn’t getting on too well with his fellow campmates though – John Barrowman was fuming that Noel accused him of scratching a rather intimate body part. Fans were quick to comment that Noel could be about to cause a rift amongst the camp, who seem to have been getting on like a house on fire over the past week. Presenter, Declan Donnelly also reported that Rita Simons had a bit of a go at Noel off camera too. It seems Noel’s power status could be going to his head slightly – but it’s all good for entertainment! Appearing on Extra Camp last night, Dec revealed: “John has already stared to crack, and Nick [Knowles] is biting his lip. Rita wasn’t very happy down at the trial… Rita had a go actually. It wasn’t on the show tonight, but while we were filming the trial, Rita had a go.